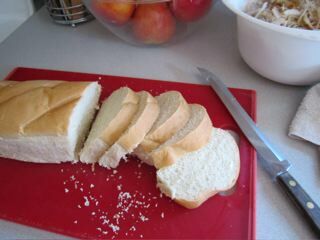 I started out with a pretty fresh loaf of french bread (if I had access to an amazing brioche, I would have loved to use that instead) and sliced it. I know that french toast is better with day old bread so to simulated that. I baked them at 250 degrees for about 10 minutes not letting them brown at all. 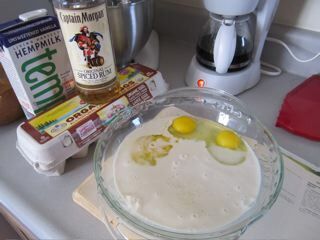 Next, I put 1 cup of hemp milk and 3 whole eggs in a glass pie dish and whisked away. And the secret ingredient is…. RUM! Well, actually it’s not that much of a secret. The recipe called for vanilla or rum. I used what I had in my little stash. The hemp milk actually turned out great! It think it added just a faint touch of texture that helped to create a really nice crust. Again, organic eggs are must! Oh yeah… and a dash of cinnamon. I put the sliced bread (once it cooled -because remember I baked them for bit) in the batter and let them soak up the batter on both sides. 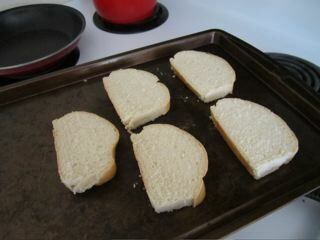 By the time I was ready to cook them there was not much batter left in the dish because the bread soaked it all up. Finally in a well buttered non-stick skillet heated to a little hotter than medium heat, I browned the toast on both sides (not sure how many minutes exactly but I would say about 2-4 minutes on each side). That was it! Why haven’t I been making french toast all this time? It is super easy and super delicious. Previous Previous post: First time making french toast – success!